[S938] National Archives - British India Office Records, Archive Ref: N/1/198, folio 27 & 142, Parish register transcripts from the Presidency of Bengal. [S6] Newspaper - Times of London, Thursday, Jul 18, 1918; pg. 1; Issue 41845; col A. [S190] Index - GRO and Office of National Statistics, England & Wales Civil Registration Qtrly Indexes, Marriage: District of St George Hanover Sq, Vol 1a, p1083. [S190] Index - GRO and Office of National Statistics, England & Wales Civil Registration Qtrly Indexes, Death: District of Hitchin, Vol 3a, p788, 4Q1926, aged 39. [S677] Index - England High Court of Justice, England & Wales National Probate Calendar, administration (with will) registered Bristol to James Algernon Stevens C.I.E O.B.E Imperial Customs Service India (retired). [S190] Index - GRO and Office of National Statistics, England & Wales Civil Registration Qtrly Indexes, Birth: District of Warwick, Vol 6d, p531, 2Q1871, mother's maiden name JEREMIE. [S116] Census - 3 Apr 1881, UK Census, ED 14 RG11-2132 Folio 32 p30 GSU roll 1341514. [S6] Newspaper - Times of London, Monday, Apr 25, 1892; pg. 12; Issue 33621; col D.
[S502] Index - Victoria BDMs online, at https://online.justice.vic.gov.au/bdm/indexsearch.doj, Birth Reg. No. 19634/1879. [S1007] Will - Joseph Nisbet Stevens. [S502] Index - Victoria BDMs online, at https://online.justice.vic.gov.au/bdm/indexsearch.doj, Death Reg. No. 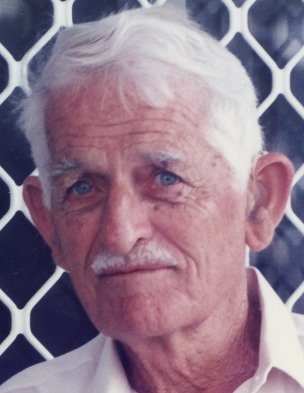 5403/1940, aged 60, as Charles Robert. [S794] Queensland State Archives, at http://www.ancestry.com.au, Queensland, Australia, Passenger Lists, 1848-1912, Series ID 13086, Registers of Immigrant Ships' Arrivals, Rolls M471, M473, M1075, M1696–1710. [S488] Index - Queensland BDMs (online and fiche), at https://www.qld.gov.au/law/…, Death Reg. No. 1876/B10601, parents William STEVENSON and Mary MCMULLIN. [S189] International Genealogical Index (IGI), Entry 7509319/49, Perth. [S328] Letter - A G Tough to D Ferguson, 2 May 1995, "The Roll of Graduates records that he graduated MD in 1862 and after service as a Staff-Assistant-Surgeon in the army emigrated to Tuapeka in New Zealand. He appears in the list of students enrolling in the anatomy class in session 1858-59. The matriculation register for session 1859-60 contains an entry in which he describes himself as being 18 years old, a second year student of medicine from Perthshire. His father is described as John Stewart, a farmer. He achieved some distinction in the class of forensic medicine, as the enclosed photocopy shows." Included is a copy of page 419 of the 'Prize and Degree List' showing Alexander Stewart achieving a Second Class certificate in Forensic Medicine. Website - Immigrant Ships to NZ, 1835-1910, at http://freepages.genealogy.rootsweb.ancestry.com/~shipstonz/…, lists the 'Ben Lomond' as leaving the Clyde 11 Oct 1862 and arriving Dunedin 19 Jan 1863. [S329] Book - W R Mayhew, Tuapeka - the Land and its People, p210. 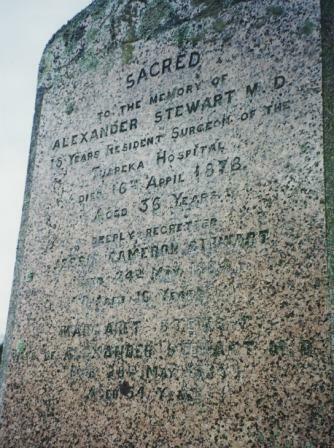 [S329] Book - W R Mayhew, Tuapeka - the Land and its People, p210 "To replace Dr. Halley as superintendent of the hospital in 1863 came a twenty-two-year-old graduate of Glasgow University, Alexander Stewart." [S330] Book - Robert Valpy Fulton MD, Medical Practice in Otago, p221 "..the committee who looked after the hospital ... advertised for a medical superintendent, with right of private practice, and were fortunate in obtaining the services of a powerful, active and vigourous young Scottish graduate by name Alexander Stewart. He came from Rannoch, Perthshire, where he was born in 1841, and had entered the University of Glasgow at the early age of 17 and become M.D. in 1862." [S329] Book - W R Mayhew, Tuapeka - the Land and its People. [S330] Book - Robert Valpy Fulton MD, Medical Practice in Otago, (p221-3) carries a longer and more detailed version of the story of this horse. [S924] BDM Registrar of New Zealand, marriage record, Reg. No. 1867/2686, married by Donald M Stuart, and witnessed by A Ferguson, MD, of Tokomairiro and Catherine Robertson of Lawrence. [S329] Book - W R Mayhew, Tuapeka - the Land and its People, p210 "In 1867 Dr. Stewart married Margaret Robertson, eldest daughter of Peter Robertson, but must have found little time for home life." [S443] CD - NZ Marriages, CD - NZ Marriages 1836-1956 V2, NZ Registrar General's Folio 1775. [S357] Will - Alexander Stewart, Archives of New Zealand, Dunedin Regional Office DAAC/9073 30 619. [S330] Book - Robert Valpy Fulton MD, Medical Practice in Otago, (p223). [S542] Index - New Zealand BDMs online, at http://www.bdmhistoricalrecords.dia.govt.nz/, Death Reg. No. 1878/2159, aged 36. [S340] Census - 7 Apr 1861, UK census, Scottish GRO 367/00 001/00 006. [S183] National Archives Film - Queensland BDM Indexes, Microfilm, Reference 1912/005882. [S183] National Archives Film - Queensland BDM Indexes, Microfilm, Ref. No. 1912/C5882. [S537] Newspaper - Brisbane Courier / Courier Mail, 27 Mar 1943, page 6, marriages. [S488] Index - Queensland BDMs (online and fiche), at https://www.qld.gov.au/law/…, Death Reg. No. 1948/B19325; son of William Gardner and Gertrude Esther Geddes. [S396] Ryerson Index to Australian Newspaper Death and Obituary Notices, at http://www.rootsweb.com/~nswsdps/dpsindex.htm, Funeral notice for 7 July, published 6 July in Brisbane Courier Mail for Alicia Leslie Gardner, late of Taigun, formerly of Wavell Heights. [S488] Index - Queensland BDMs (online and fiche), at https://www.qld.gov.au/law/…, Marriage Reg. No. 1909/8151. [S488] Index - Queensland BDMs (online and fiche), at https://www.qld.gov.au/law/…, Death Reg. No. 1933/B20943; son of David STEWART and Alicia GRAYDON. He was widowed at age 84 on the death of his wife Maureen on 21 April 1998. [S183] National Archives Film - Queensland BDM Indexes, Microfilm, Ref. No. 1914/C6149. [S488] Index - Queensland BDMs (online and fiche), at https://www.qld.gov.au/law/…, Marriage Reg. No. 1941/B45983. [S1115] Personal knowledge of D Ferguson, information gathered at family reunion 12 Mar 2017 - inscription in their wedding band. [S537] Newspaper - Brisbane Courier / Courier Mail, Funeral notice, 8 Jan 2009 edition.